If you have young children, Halloween is undoubtedly an important landmark in your fall holiday schedule. From the costumes, to the crafts to the trick-or-treating, kids love Halloween. Why not capitalize on their affection by hosting your own Halloween bash? Here are some suggestions for how to make your kids’ Halloween party a spooktacularly good time! Bobbing for apples – great, old fashioned fun, but not for the germaphobe. Guess how many candy corns are in the jar – fill a glass jar (craft stores carry pumpkin-shaped ones) with candy corns and take guesses from the kids as to how many are in there. The one who comes closest wins the jar. Charades — older children can act out Halloween words and phrases, such as jack-o-lantern, scarecrow, trick-or-treat and more. Play dough — the preschool set loves play dough, so why to whip up your own batch of bright orange dough to set out with Halloween-themed cookie cutter. Pumpkin carving — if you’d rather not have the mess of a multitude of real pumpkins being carved in your home, you can let party-goers design their own jack-o-lantern with cut-out paper pumpkins, black construction paper, scissors and glues sticks. 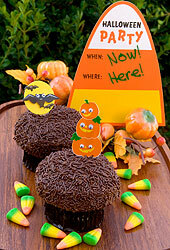 Make your little guests scream from fright and delight with these ghoulish snacks. Peel the eggs and cut them in half lengthwise. Remove the yolks. Fill the yolk hole with cream cheese. Press an olive into the cream cheese eyeball. Dip a toothpick into red food coloring and draw “broken blood vessels” in the cream cheese.